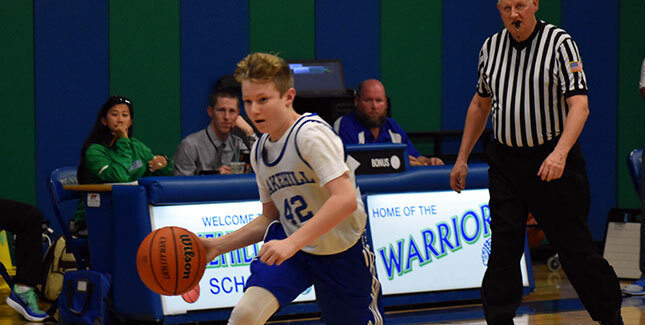 Interested Middle School boys are encouraged to join the Warrior Basketball team, winners of the 2014 IAA Championship, 2015 Runners-Up, and 2016 Semifinalists. Team members practice daily in the fall, in preparation for the season. Interested athletes are encouraged to join the team at all levels of expertise. Basics are taught as well as skills to increase the abilities of current players. The program is designed to instill a hard work ethic and winning spirit. Commitment to the team is expected of all Warrior athletes and regular attendance at practice is required. The team participates in the IAA League with similar sized schools. Middle school athletes not only learn the basics of basketball, but also develop a sound foundation to transition to Lakehill’s Varsity Basketball team. Check the RenWeb calendar for up-to-date Athletic Schedules.